Great, very easy, yum yum yum. Susan made this for New Year's eve and it was so good. I think she used the non-cheater's version with dry beans and chuck and pork shoulder. Tweaked this over time to make it simpler. Use fresh green sauce. I buy mine from the Indian fast food restaurant. I pick up the potato curry needed for this dish there as well. If not, I substitute TJs chick pea curry or spinach. TJs precooked lentils work well in this dish, saute them with garlic, shallots. Shred a rotisserie chicken. If time permits, heat the chicken to just above room temp before assembling. Don't mix lentils and curry together. Instead layer: lentils on the bottom, fresh arugula, tomatoes and cucumbers draped on top, roasted chicken next, drizzle with yogurt green masala dressing, and warm curry on both sides. Makes for a lovely presentation. So, so good! I love this recipe. Similar to the crostinis served at Mozza. Be sure to finish with grey salt, balsamic reduction and good quality olive oil. I used fennel instead of radicchio and vidalias instead of shallots. I am thought it was snap to make and pretty good. I will try again the vegetables intended. The balsamic drizzle is key. Quick?! Depends on how you look at it. Yes, it is quick after you have all the ingredients right beside your wok. Fun? yes. Good? yes. But not quick in my cooking dictionary. Someone gave me a bottle of Sweet Chili Sauce Mae Ploy. It is way too sweet for my taste but when I mixed some in lime juice and added a little fish sauce, it was much better. My husband really liked it and it certainly is easy which appeals to me. Excellent. Try substituting ginger cookies instead. Award-winning chef Nancy Silverton has conquered the gourmet world as the original dessert chef at Spago and founder of the celebrated La Brea Bakery. Her recipes are legendary, innovative, and delicious. However, in the last few years, there has been a great shift in cooking toward the Home Meal Replacement (HMR), better known as "takeout." It's impossible to spend hours in the kitchen after a hard day's work, so more people are buying prepared foods and frozen meals, compromising taste for convenience. Realizing that people's hectic workdays don't afford everyone the time to re-create her epicurean triumphs, Nancy has come up with the perfect solution . . .
Compiling a list of her favorite products that come in jars - and cans, bags, and boxes - Nancy has created easy-to-follow recipes that require less than thirty minutes to prepare. With this book there's no need to sacrifice flavor, sophistication, and taste just because you're spending less time chopping, cleaning, cooking, or baking. Nancy's shortcuts not only allow us to produce quick and easy meals at home, they let us bring back the pride and the joy of creating gourmet meals for our family and friends. 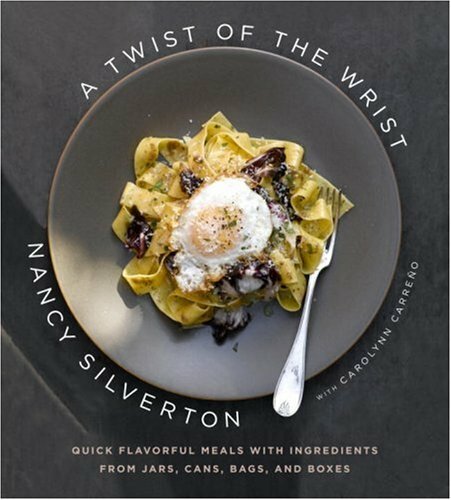 In addition to Nancy's own creations, she includes recipes concocted with prepared ingredients from some of her chef friends, including Sara Foster, Tom Colicchio, Charlie Trotter, Mario Batali, Suzanne Goin, Ruth Reichl, and Jean-Georges Vongerichten. There is also a pantry section, telling us where to get - by the Internet and mail order - the best of all things canned, jarred, and bottled. This charming and utterly indispensable cookbook is suited for any type of cook, whether you're an on-the-go gourmand or you just love flavorful, accessible meals at home. A Twist of the Wrist fits perfectly into today's modern lifestyle and is a must-have for the contemporary kitchen.